Hi, I am interested in your 1957 Studebaker Commander (stock #19GKM20) listed on Autotrader for $24,900. I'd like to get more information about this vehicle and confirm its availability. Originally a California Car - Full Professional Restoration completed - 259ci V8/3 Speed Manual Transmission with Overdrive - Great condition all around - (Please note: If you happen to be viewing this vehicle on a website other than our main website, its possible that only some of our many photographs of this car are presented due to website limitations. To be sure you access all the photographs, please go to our main website: Garage Kept Motors.) 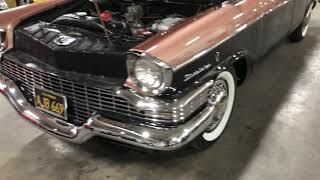 1957 Studebaker Commander Provincial Station Wagon Garage Kept Motors is pleased to offer this classic, rare Studebaker Wagon for consideration. Studebaker was known in the industry for building a stout automobile, ones that performed well and withstood the test of time. This example is no exception, and to make it even more desirable, Studebaker only built 3,885 of these models. The car is originally from California with the original black plates still displayed. It remains in excellent condition inside and out. In 2015, the car had a complete and professional restoration, which included an entire driveline rebuild. The paint is the original color combination of two-tone Black and Rose Gold with a triple stage clear coat finish. Chrome and stainless surfaces remain in brilliant condition. Interior was also restored to factory specifications with all seats folding down for versatility. The motor is an original 259ci/180hp 2bbl V8, 3-Speed Manual, Power Steering, and a rare overdrive transmission. The car was also just service with a fresh battery, fuel pump, and brand new period correct white wall tires. This is such a unique vehicle at a very reasonable asking price. It also comes with California registration records, original owners manual, and promotional literature. You wont find another one this clean at this price point. No expense was spared in the restoration. Be sure to check out all the photos and video on our main website: Garage Kept Motors. Call if interested or e-mail with any questions. Thank you for looking.